Parking around the north end of the circuit has always been crazy in my experience. Certainly that parking near Eau Rouge tends to be VIP only as far as I can tell. 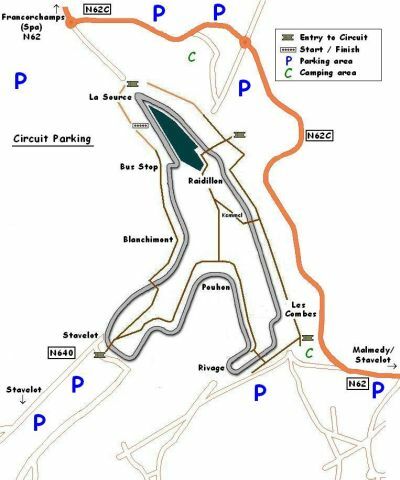 Other parking spots around the north of the circuit can be used on a first come first serve basis. However I have often found myself having to drive through a few of the large camping areas before being directed in to a field. With the Belgian climate allowing for shall I say, the odd drop of rain from time to time, these fields can be a little tricky for my Alfa to deal with! A lot of people arrive very early and simply find a pull in somewhere on the side of a road, in a ditch or whatever. This is a little risky if you ask me as I have seen the odd car being towed away because I think they were blocking a field entrance that was to become an official overflow parking area later in the day. Parking south of the circuit is again very busy but I have always found a spot in a field. Recently I have arrived at the circuit only 2 - 3 hours before the race starts and been able to park within 15 - 20 minutes walk of the south entrance near Les Combes. Sometimes even closer. The south of the circuit is also good when it comes to leaving. The two two way roads from the circuit through Stavelot and out towards Trois Ponts are made one way so once the traffic is moving it flows out for miles and miles pretty well compared to some other circuits I have visited. On one very muddy day there were a number of tractors about pulling out cars that had got stuck. A lot of people do park further away down towards Stavelot and simply walk. It's a decent length walk and uphill all the way. At least coming back afterwards is a bit easier! I have found parking for this event pretty busy for the hours leading up to the race although nothing like it is for F1. However within a couple of hours of the start people head off it would appear. I have then been able to drive around parking within no more than 10 minutes walk from the various parts of the circuit. It's great being able to watch at Eau Rouge and then drive down to the other end of the circuit and watch for a few hours before heading round somewhere else. It again gets very busy on the Sunday as the end of the race draws closer. When I get the time I intend to expand on this page detailing the various places I have parked, where I came from to access the parking etc. However I hope the above is useful for the time being.